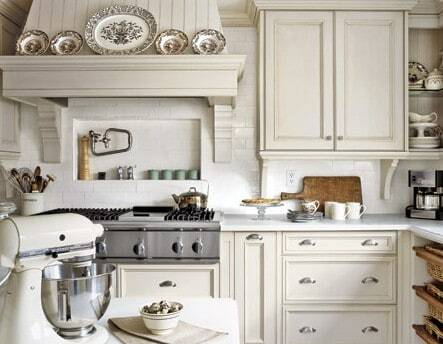 Cream and White Kitchens: Happy Accident or Stroke of Genius? I love color in the kitchen. I love it so much that my own honey maple cabinetry and laminate countertops hurt me to my soul sometimes. It’s only for a moment now and then, and then I shake out of it and remember the gobs of storage and room I have and think, well, not only of third world countries and people starving and dying of 18th century diseases, but also my former Manhattan apartment with its postage stamp linoleum and roach kitchen with no dish washer or working freezer, and I feel like an entitled little wench. Still, I have a Pinterest page called Color in the Kitchen where you can go for lots of inspiration if you’re ready for your own re-do! I can live vicariously through you just fine. But we’ll start there anyway for a little background. I think I would have died and gone to heaven. This is my friend Joan’s kitchen (you must go to the link and look at the rest of her house), and it’s been featured in a number of shelter outlets as well as on her super popular blog. Like Mary Poppins, “it is practically perfect in every way” — homey, bright, friendly, patina-galore. I actually got to drink a martini in this room. 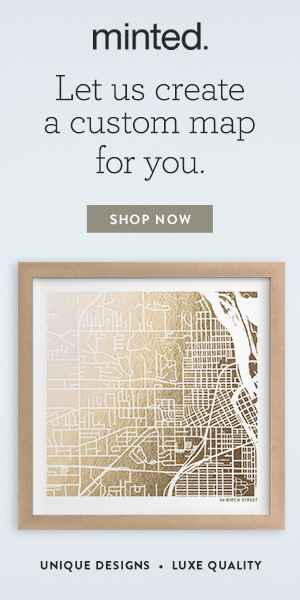 The buzz induced design fantasies in poor honey-mapled-out me. 🙂 Way to go, Joan! 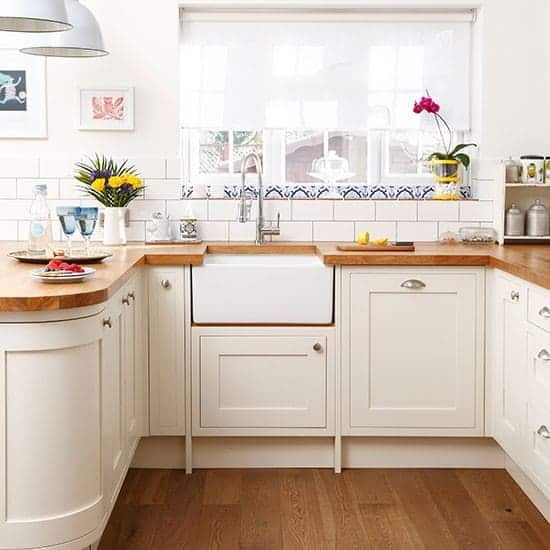 White kitchens are beloved the world wide for a number of rather obvious reasons — they are bright, airy, they re-sell well, have a basis in tradition, and, for some reason, they feel clean. Why is that? In the 19th century … kitchen and bathroom designs were given a great deal of “scientific” thought regarding efficiency, motion study, and sanitation…. 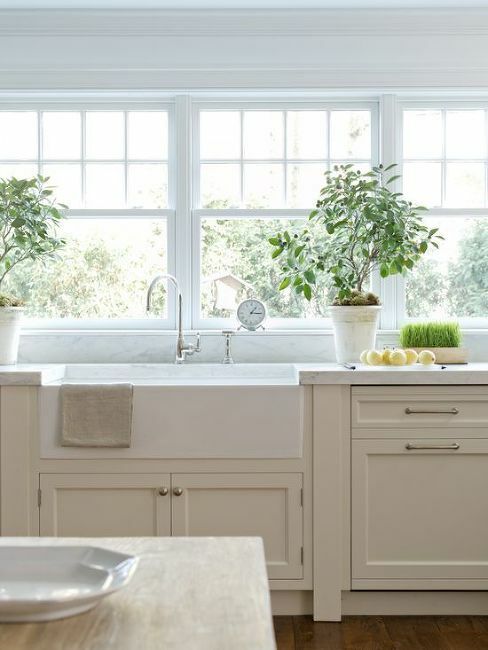 WHITE, because of its association with sanitation, became the prevalent color for sinks and other fixtures and surfaces in bathrooms and kitchens. 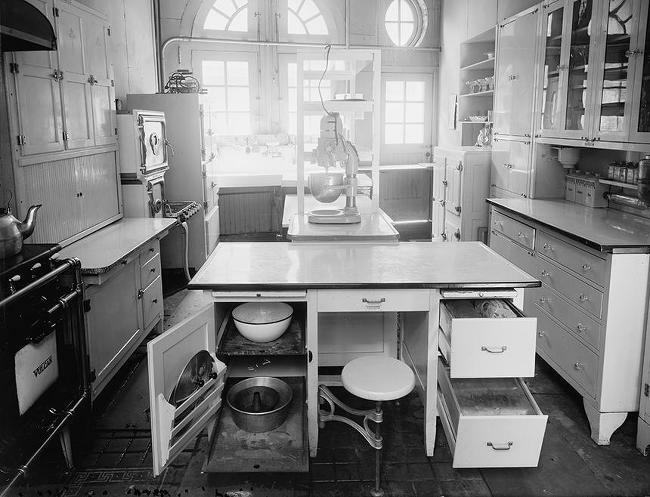 This obsession with sterility led one observer to complain that when cutting up “a fowl in these kitchens one felt quite like a surgeon performing a major operation.” White retained its dominance until the 1920s, when there was a return to color in wall coverings, floors, and even ceramic tiles. Would you mind having your appendix out in the above? Isn’t this glorious? I swear I hear angels singing. 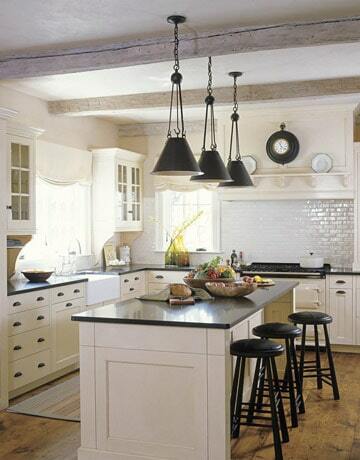 I adore the above mix of dark hardware, marble (or white quartz) counters, white farmhouse sink, and wood on the island. The white stoneware is like sculpture. But there’s a science to this harmonious mix. It may have happened in kitchens of old by accident, but you have to create it today intentionally. You do that by having a hefty balance of both shades. 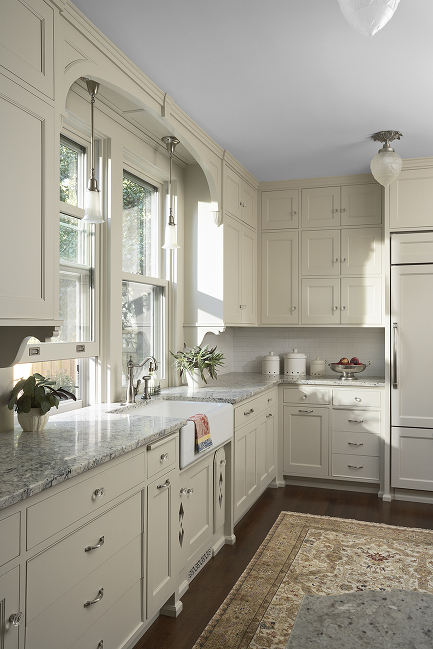 Cream woodwork: IMO, cream kitchens look best when all woodwork — cabinets, baseboards, door and window moldings — are painted cream, just as though, once upon a time, they were painted white and yellowed with age. White walls: I think it’s best when your walls are white. It was the enamel paints (those used on trim) that yellowed most. The walls didn’t change as much and stayed lighter. 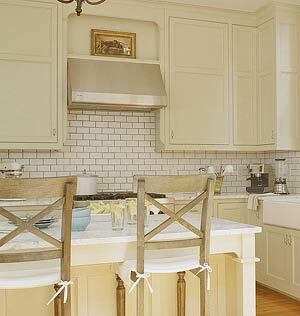 Tile, shiplap, plaster, paint…let it be white. 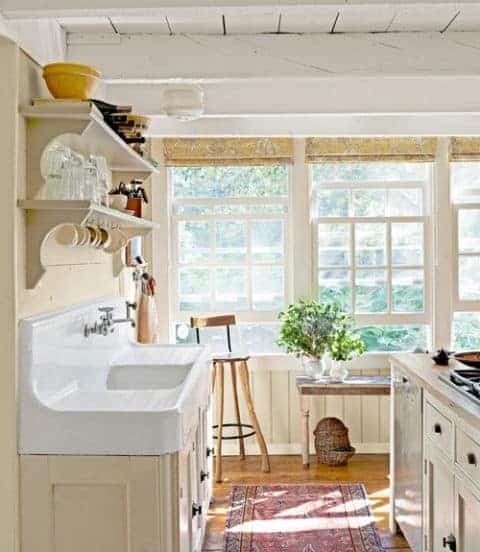 Additional white to your taste: Then you can add white counters (but soapstone and wood look beautiful, too — think old school), white farmhouse sink, and white appliances if you want. So much soul in this one, that I wish I could find the creator and credit him/her. 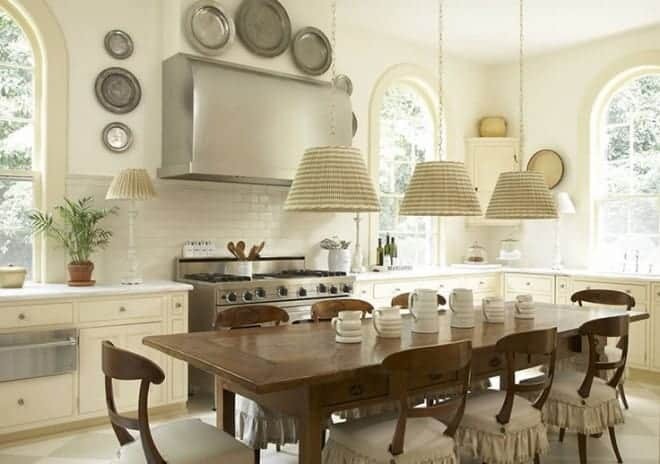 I love a farmhouse table in the middle of the kitchen rather than an island. 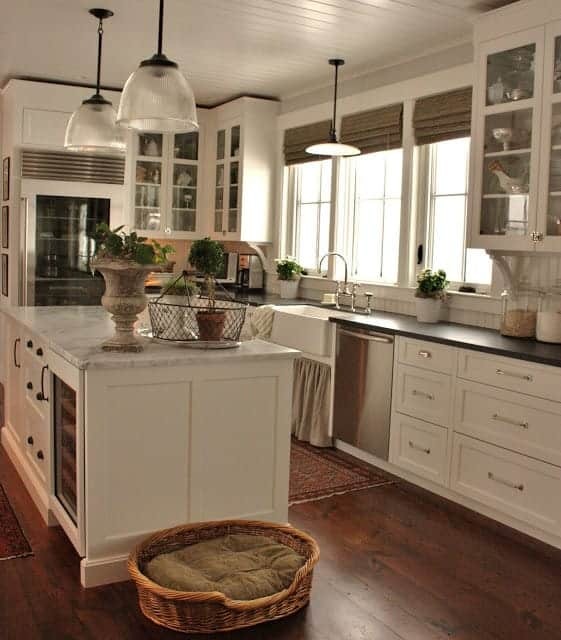 I wish my own kitchen were laid out this way. The gingham lampshades on the pendants are fresh and friendly. Another unknown one, but I’ve had this one on my personal Pinterest page for a couple of years at least. The tile treatment over the range is not may favorite. I really prefer to keep the backsplash consistent throughout. And I think I would have liked to have seen a vintage reddish Persian runner here, but overall, very lovely and airy. Great counter stools. The woodwork around the window is white here, which I would usually would like to see in the cream color. 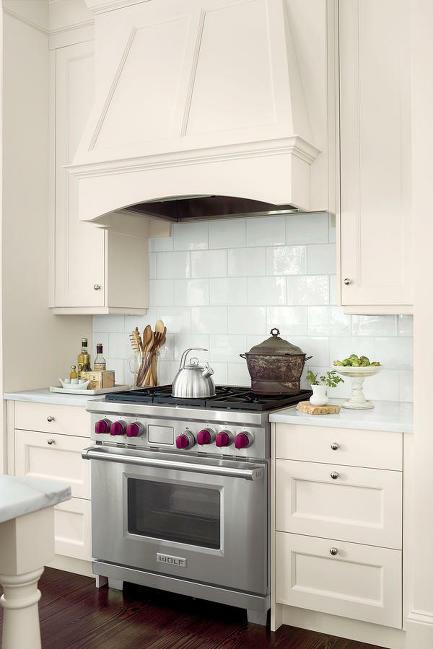 I’m very curious to see what the kitchen looks like as a whole and what the white window trim looks like in the bigger picture…. 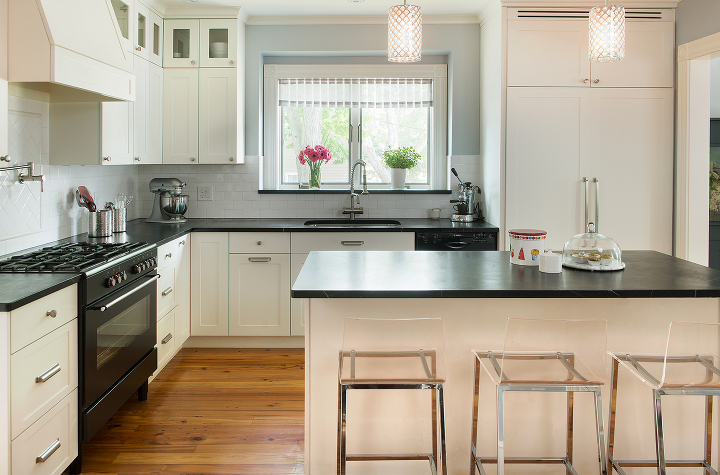 Soapstone counters and dark hardware look amazing, too. The below two images from a kitchen by Susan Tully took my breath away. Warm blue paint on the walls in the above. It works because the undertones all coordinate. 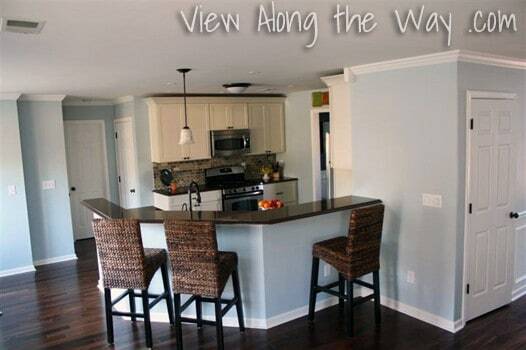 Lastly, wood counters also look warm and wonderful. 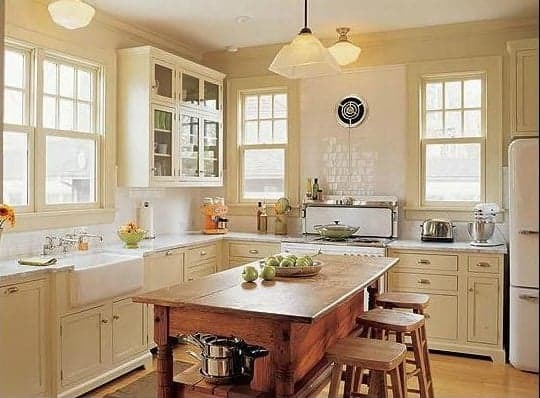 Besides the below two images, you can get an idea of how wonderful wood looks with cream by some of the earlier pictures with farmhouse tables in the middle of the kitchen. When is it a no-no? When NOTHING else is white. 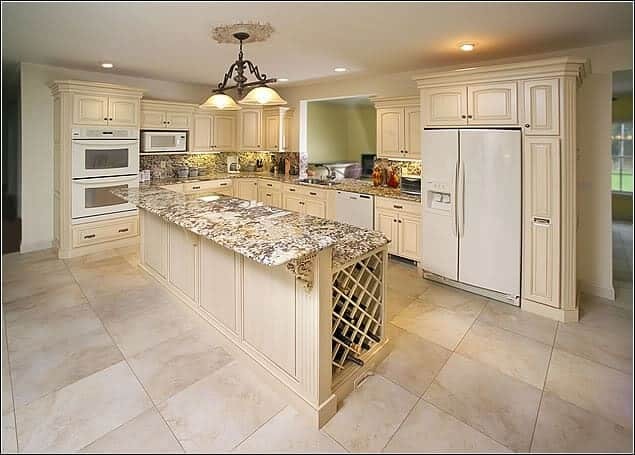 See the below two images (try to ignore the dated brown glaze on the cabinets in the first pic and all the crazy, variegated hard surfaces in both). They just look like the homeowners were trying to save money. 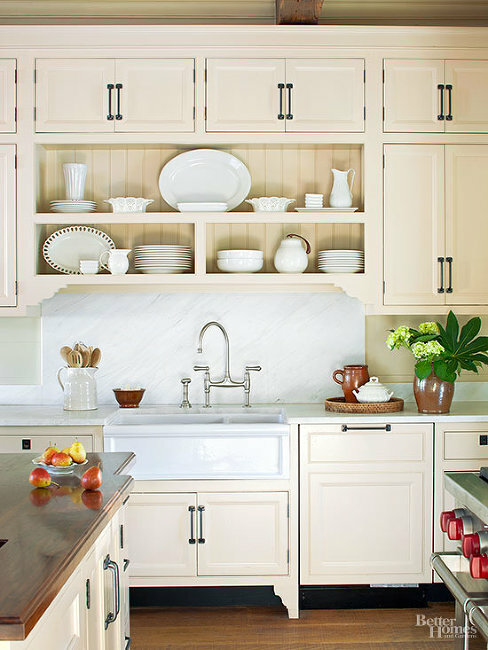 If you have cream cabinets but no other white in the room, go bisque, or stainless, or black for your appliances depending upon the undertones of your hard surfaces. 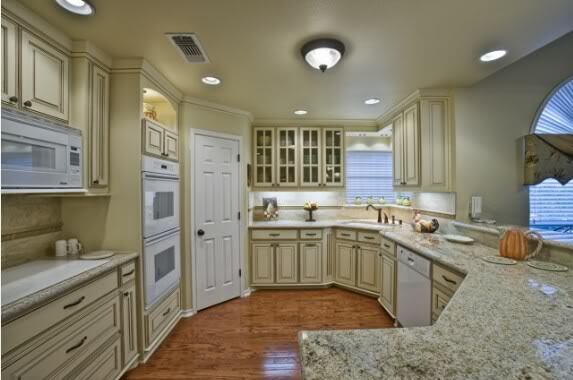 Also, if you have an open layout with white trim — sorry Charlie, but you can’t have cream cabinetry. The heart bleeds. Kelly wrote about the way she ended up with the above in a hysterical post entitled, “How to Completely Mess Up Your Kitchen Remodel: A Step-by-Step Tutorial.” To her credit, she wan’t going for a cream and white kitchen; she wanted a white one. Her mistake was going to a place like Home Depot and letting a “kitchen designer” who had never seen her space influence her decisions. Sometimes it’s cheaper to hire a decorator, folks, rather than make very expensive mistakes all by your lonesome. What do you think about cream and white? And while I have you, make sure you never miss another post by signing up to receive Home Glow’s Saturday blog straight to your inbox! Enter your email in the left sidebar. And tell your friends! Love this post Amy and all the photos! I’m honored to be included! 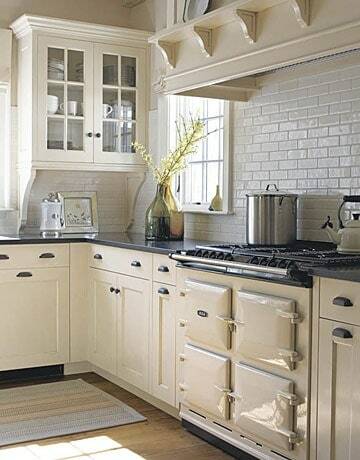 I’ve always had and loved a white kitchen-even before they were as popular as they are now. I think it was always the “clean” factor that pulled me in!